Dharma Devi is a creative Italian woman who recently moved to the in response to a personal spiritual call. Whoever has had the privilege to know her since long time knows very well how many talents she has. Not only Dharma carries an extensive knowledge about Yoga philosophy and its techniques, but also she has a deep love and respect for all kind of spiritual paths, and her passion about art, theater and dance has accompanied her since forever. In fact, she has been trained and she has performed as Indian Classical Dancer, and classical theater actress since very young. Dharma has been practicing yoga since childhood, and she has extensively practiced Hatha Yoga as the old tradition taught by Siri Aurobindo for over 15 years. In 1999-2000 she started practicing Kundalini Yoga, which has brought an incredible and intense wave of transformation into her life. After a long and disciplined training which has brought her to move to Rome from Turin, she has become an instructor of Kundalini Yoga and then a Teacher Trainer as well. 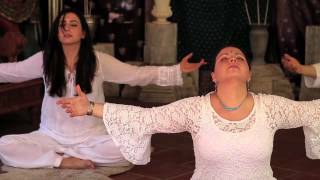 Dharma Devi has been learning Shakti Dance directly from Sara Avtar since when Avtar started to share this amazing technique with the world. In fact, Dharma was one of the first teachers trained by Sara Avtar in Europe over 10 years ago. She is now one of the two Lead Trainers of Shakti Dance available in the world besides Avtar, and she has the responsibility to share the teaching of Shakti Dance in the America Continent. Dharma discovered to have healing abilities when she was very young, but only recently, she has fully embraced these abilities and consciously incorporated in her classes of Kundalini Yoga and Shakti Dance. As a result, she has also developed a special technique called Rasa Healing. She is a real empathetic Teacher. Recently, Dharma Devi's constant spiritual research has merged into the mysticism of Persian Dance, which has enabled her to make her classes extremely mystical and creative without loosing their physical component. In addition to a very rich background Dharma Devi hold a degree in anthropology of theater and dance. She travels throughout the and she is now expanding her work in the NJ-NY area. I love Dharma and her workshops! They are amazing and very uplifting, raising fantastic shakti and a lot of fun! I highly recommend her. I have been fortunate to have Dharma come to Malibu,CA twice a week to teach Kundalini Yoga. I began in the seventies with Siri Dharma Kaur, and practiced Kundalini for many years. I now have Dharma and find her trainning equally moving. Perhaps it is because they are both Italian? Their passion for their work is remarkable and I am truly greatful. SHAKTI DANCE™ School in the U.S.
Shakti Dance™ Teacher Training U.S.A.